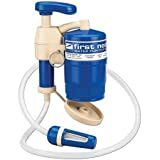 The new and improved upgrade of the popular First NeedDeluxe, the XL includes direct connect canister for trail/bikewater bottles plus a sanitary cover, Matrix Pumping hands-freesystem, tote bag, long inlet hose with pre-filter/float. Flow rate of 2.0 qt./min. Average canister capacity of 150 gallons. Tote bag and "hands-free" gravity feed kit included.